Burgos Cooking Workshop. $25 / Free with invitation code (limited spots). A participative demo class with chef’s David Izquierdo and Ricardo Temiño. Modern tapas based on traditional products from the region of Burgos. Your chance to recreate your own regional tapas with a boldly modern twist. David Izquierdo is executive chef and owner of the restaurant Los Rastrojos and has recently opened his second establishment, El 51 de Sol, both in Aranda de Duero (Burgos). He defines himself as a thinker-cook and his cuisine is the result of a studied balance between traditional flavor profiles and the sophistication of today´s techniques. He is a convinced defender of seasonality and likes to play with these limitations to make cooking a fun and fascinating activity. He has received numerous local awards, and has maintained the first position for the past eight years on the Tapa de Oro (Golden Tapa) competition that is organized by the Restaurant Association in his home town, Aranda de Duero. Ricardo Temiño has kept his heart in Burgos while traveling and gaining further culinary experiences in places like Tokyo, Lyon or Brussels. He has participated in numerous cooking competitions and was semi finalist in the Best Chef 2014 Competition in Spain. He obtained a second place in the Certamen NACIONAL de Cocina (2013) and also a second place at the regional Bocuse d’Or 2012 selection. 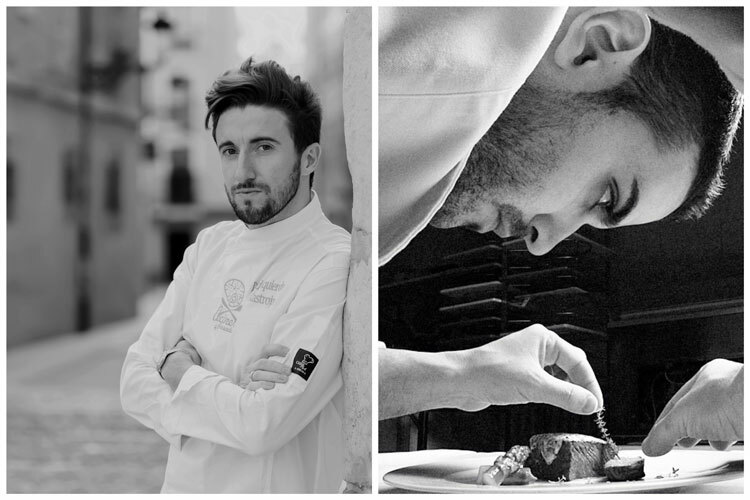 In 2016 he was named Best Young Chef at the International Chefs Congress Madrid Fusión 2016. A convinced Burgos guy, he is proud of his region, its people and its cuisine, which he understands as a way of life. $25 / Free with invitation code (limited spots). Burgos. Rooted in Tradition. $25 / Free with invitation code. Spanish Cuisine. Demo and Dining (Le Cordon Bleu Madrid). $25/Free with invitation code (limited spots).